Urinometer. From Lammon et al., 1995. /uri·nom·e·ter/ (u″rĭ-nom´ĕ-ter) an instrument for determining the specific gravity of urine. A hydrometer for measuring the specific gravity of urine. any device for determining the specific gravity of urine. Also called urometer. 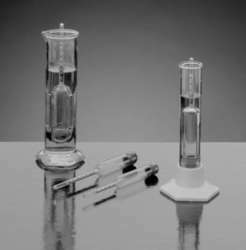 See also hydrometer. Instrument used to measure specific gravity in urine, now largely replaced by the dipstick method. Serratia marcescens nosocomial infection of the urinary tract associated with urine measuring containers and urinometers. 025 cannot be measured reliably with current ionic concentration methodology and should be tested with a refractometer or urinometer. Reflecting his apparent interest in new technology, he was later responsible for placing an ambitious order for four stethoscopes, four cases of dissecting instruments, four barometers, four atmospheric thermometers, four register thermometers, three rotatory electro-magnetic machines, four urinometers, six pluviometers, one case of acupuncture needles, and three microscopes of "good power for pathological purposes for Quebec, Montreal, & Kingston. Its main product, The Yellow IRIS urinalysis workstation, as well as its Biovation-line of urinometers, CHEMSTRIP/IRIStrip urine test strips, IRISpec urine controls and other consumables, are widely used in major hospital laboratories nationwide. Contract notice: Open procedure for the award of the supply of urine bags and urinometers required the hospital clinical institutes of improvement of milan, the hospital san gerardo and the fondazione irccs national cancer institute of milan, for a period of 60 months . Tenders are invited for Supply Of Graduated Cylinder, Microscopes Binocular With Accessories And Urinometers To Dept.